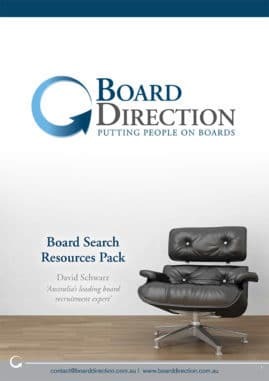 The most COMPREHENSIVE and DIVERSE list of non executive & board VACANCIES in Australia – over 2500 annually. Access EXCLUSIVE member BENEFITS & VACANCIES and FAST TRACK a board appointment with our TAILORED packages. With more than 15 year's board recruitment experience, David will show you "How to take the Stress out of finding & gaining your Next Board Appointment"! Dates are available in Sydney, Melbourne, Brisbane, Perth, Adelaide & Canberra. This may be the best 2 hours you invest in your board career! Non Executive Career Support: Masterclasses, On-Line Board Ready Course, Board Application Preparation, Custom Board Ready CV & LinkedIn Profile Writing. Proven Governance Services: Developing Better Board Governance, Governance Accelerator Program, Board Governance Reviews, NED & Executive Remuneration Reviews. As you are aware, gaining a board role is a highly competitive process. Download our Board Resources Pack and get the tools you need to help separate you from the competition!